Shoppers Drug Mart has a new contest! Load your Optimum coupons at the link below for a chance to win instantly with every play, there are no PIN codes or purchase needed with this one! There are 100,000 prizes available! Prizes include Android tablets, 38,000 Shoppers Optimum Points, 95,000 Shoppers Optimum Points, 50,000 Shoppers Optimum Points or even 1 Million Shoppers Optimum Points! Earn badges to get even more plays everyday, badges include Night Owl (playing after 12am), Early Bird (playing before noon), loading your first coupon, loading 10 coupons, loaded coupons every week, played 5 days in a row, top of the pyramid and collect all badges. 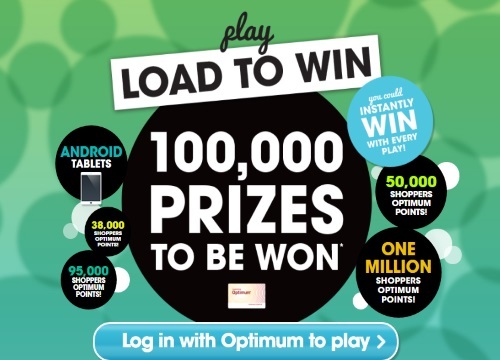 If you in instantly, I've won 1000 Optimum Points a bunch of times now, you will see it appear on your screen with a skill-testing questions. The points get added to your account straight away. Contest is valid June 18-July 15, 2016.